ViewRay, Inc. has received 510(k) clearance from the U.S. Food and Drug Administration (FDA) to market new soft-tissue visualization capabilities for its MRIdian system, according to a February 21 press release. "Today we announce another significant step forward in our drive to better treat cancer patients and further differentiate MRIdian in the marketplace", said James Dempsey, Ph.D., Founder and Chief Scientific Officer of ViewRay. "Our customers are seeking significant improvements on imaging speed, resolution and brightness. They also demand that we avoid artifacts and distortions that have historically and consistently plagued the field. We believe these innovations hit the mark. We will continue to advance the field of MR Guided Radiation Therapy and expand the application of the MRIdian system." MRIdian's SmartVISION provides high-definition, diagnostic-quality MR imaging. SmartVISION was designed to maintain high-fidelity beam delivery, while mitigating the risks of skin toxicities, as well as trapped or distorted dose. 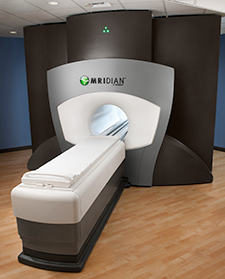 MRIdian's SmartADAPT helps allow clinicians to generate daily MR setup scans in seconds and leverage high-contrast anatomical detail to rapidly reshape dose delivery based on the current position of both the tumor and adjacent critical structures – all while the patient is in the treatment position. MRIdian's SmartTARGET visualizes the tumor's edges and surrounding organ position in real-time using a non-ionizing, streaming video perspective. When tumors or organs-at-risk change shape or position, SmartTARGET instantly reacts, automatically controlling beam delivery. ViewRay earns FDA 510(k) clearance for soft-tissue visualization capabilities on MRIdian MRI-guided RT system. Appl Rad Oncol.